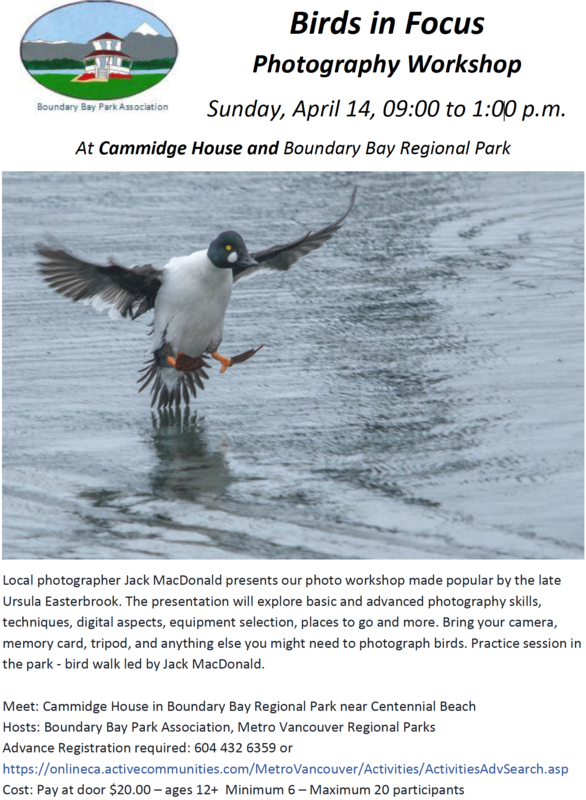 Sixteen participants braved the windy and cold elements on Wednesday, March 14, on our Delta Nats quarterly “Birds on the Bay” Casual walk around Boundary Bay Regional Park. We were: Anne M, Roger, Sam, Ken & Anne, Bryan & Janet, Deborah, Gerhard, West Van’s Derek, Marilyn from Victoria, and our Delta Nats Ladies Jennifer, Eleanor, Rochelle & “Don”, and me. 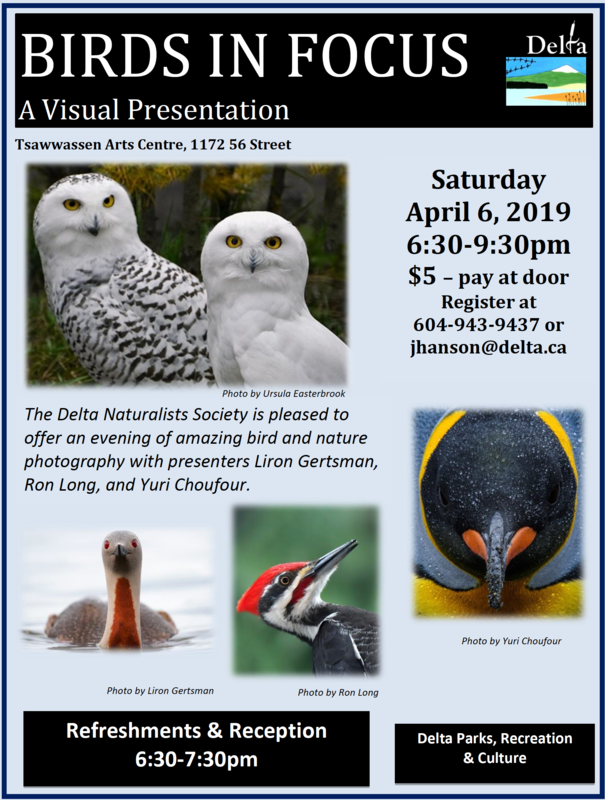 Hi-lites were: a Common Teal, lots of Brant Geese, a few Sanderling, and the scrumptious home-made scones and cookies prepared by the Delta Nats Ladies. Check out Ken and Bryan’s photos of the outing on our DNCB Picasa site at https://picasaweb.google.com/dncbirding. 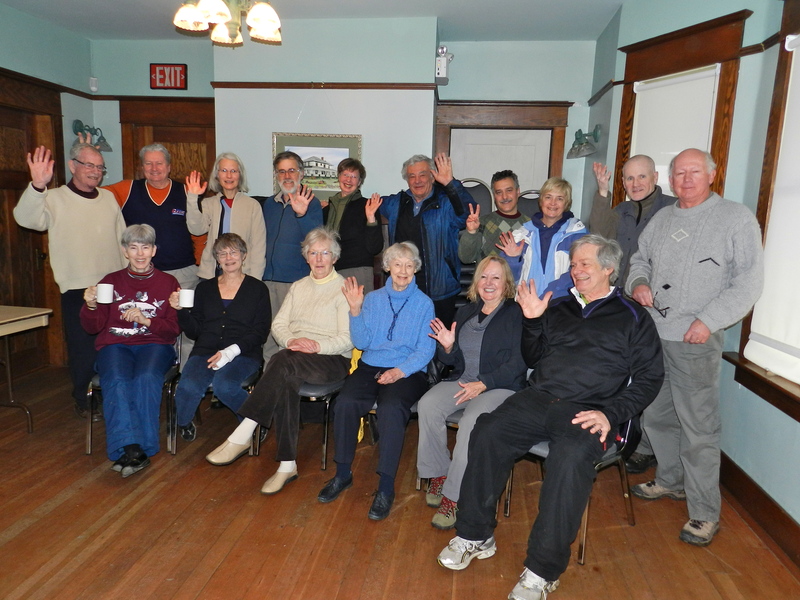 We met at historic Cammidge House (CH) at 9:00 a.m. Following introductions and inane chatter about how ridiculous it was for us to be venturing out in this weather not fit for man nor beast, we walked toward Centennial Beach. Among the Mallards and American Wigeon in and around the pond next to the old Concession Stand, we were able to locate one male Eurasian Wigeon. 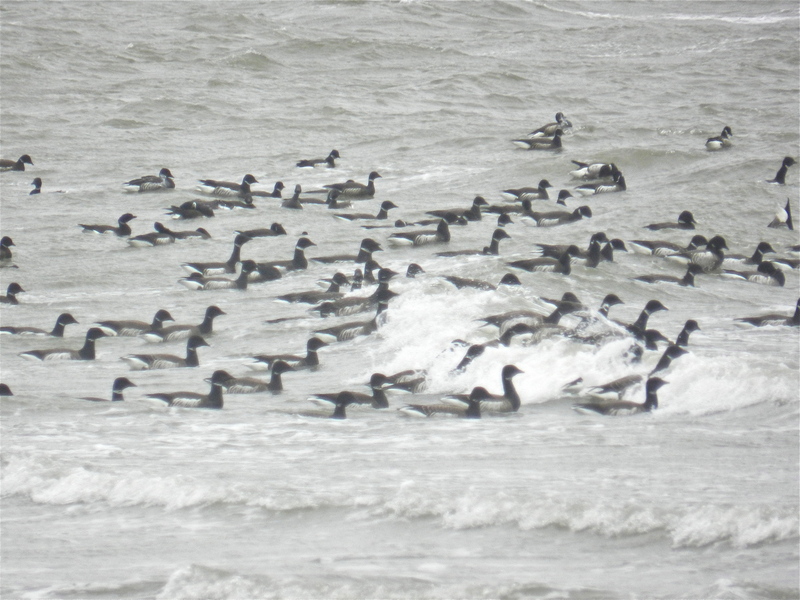 The tide was in, but it was very rough; we saw a few Scaup and Scoters in the distance. One lone Kite Surfer amused us frozen stiffs on shore. We decided to follow an inland trail as it was unlikely that we would see any Western Meadowlarks or other song birds along the beach path. We passed the new Concession Stand which is “coming along”; the Grand Opening is scheduled for Father’s Day, June 17. 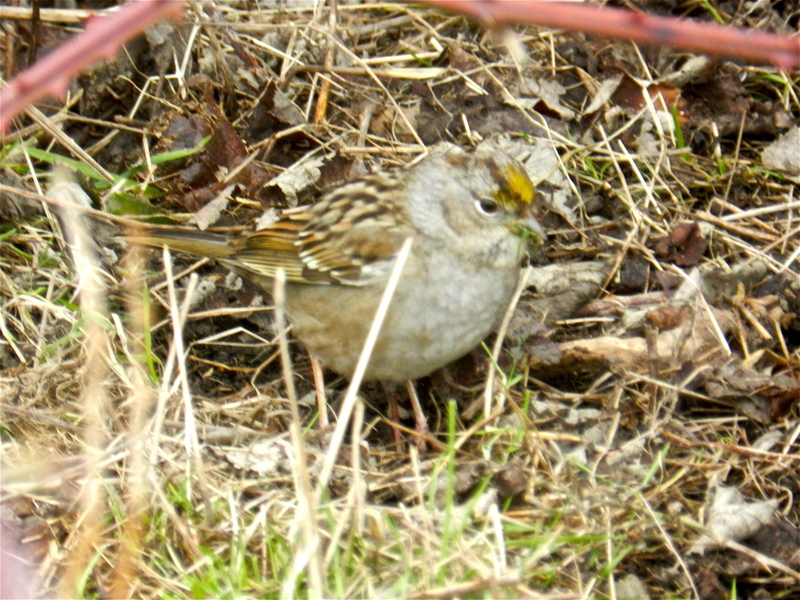 In the shrubs we saw several flocks of Golden-crowned Sparrows, with the occasional Fox and Song Sparrow among them. Resident Northern Harriers occasionally floated by and a “huge” Red-tailed Hawk perched and posed in a tree. I guess it was fluffed up by the wind which gave it the larger than normal appearance. We did not see any Tree Swallows hanging around our Bird Boxes; we expect them soon. At the Lookout near the Pumping Station, we met Maranda who is doing her SFU thesis on Brant Geese. 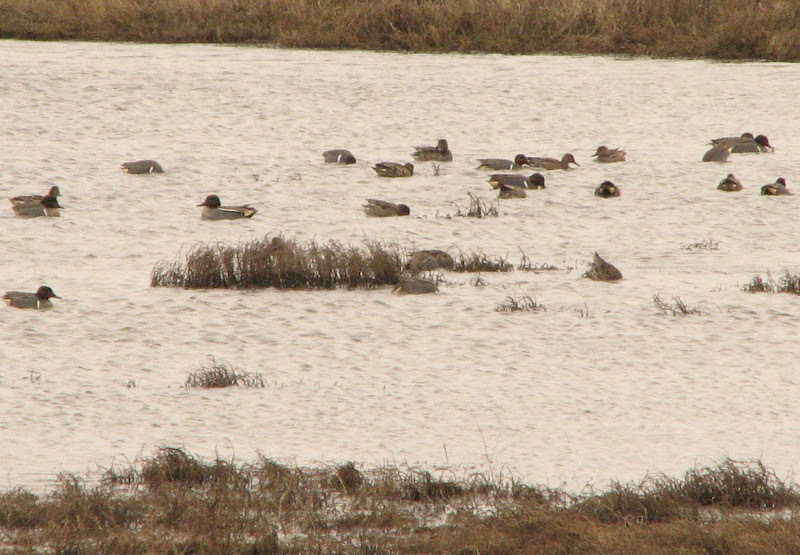 There were 100+ Brants there, occasionally being rousted by Bald Eagles. Maranda pointed out three Brant with injured legs, probably from gun shots. A few (3) Sanderling were foraging on the shore right in front of us. Several Green-winged Teal around too, and we found the one Common (Eurasian) Teal that Tall Rick S. had reported seeing on several occasions (see Bryan’s photo below & on our Picasa site). 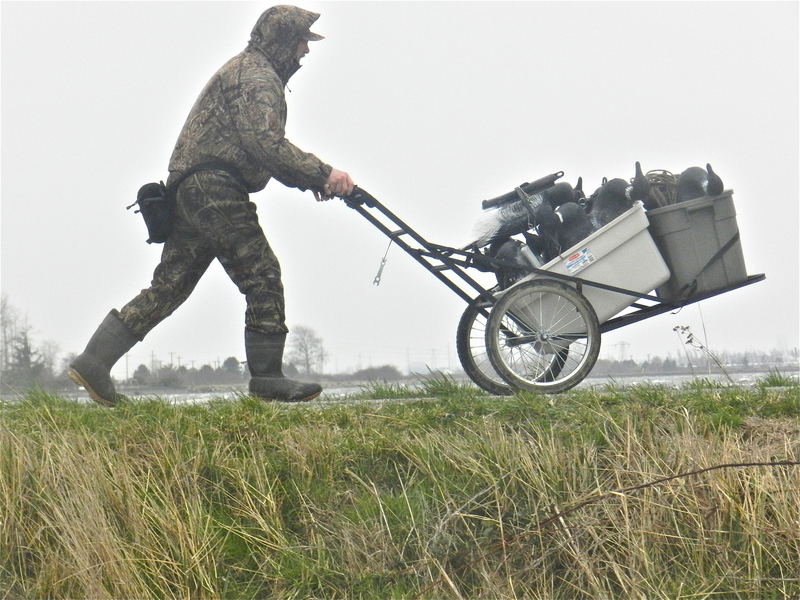 An interesting sighting as we were leaving the Lookout was a camouflage-regaled Hunter pushing a wheelbarrow full of Decoys toward the Bay; I guess hunting season is open to the end of March. We raced back to Cammidge House, stopping briefly to check the Boardwalk for Sam’s Virginia Rails (no sign of them). At CH, everyone was so happy to see Jen’s, Eleanor’s, Rochelle’s and even Don’s smiling faces; we wolfed down the hot soup, cheeses, fruits and especially the delicious home-made goodies. I wonder whether the large turnout on such a crappy morning was for the birds or the Delta Nats Ladies’ goodies. 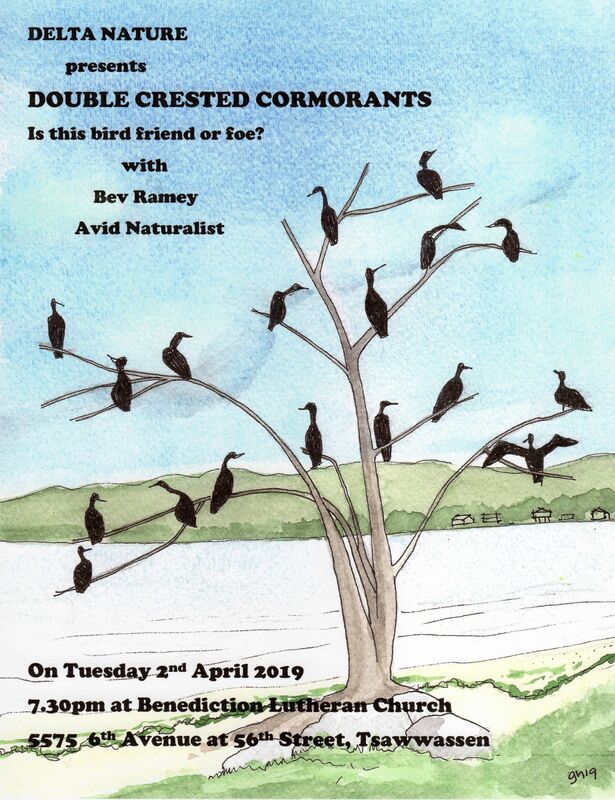 I will be at Petra’s next Monday, March 19, for departure at 8:00 a.m. on a DNCB outing to Colony Farm. We should be at the parking lot near the Gardens by 9:00 a.m. for those meeting us there. Also, on Tuesday, March 20, volunteers are needed at Reifel to help install some new Swallow Nest Boxes, starting at 9:45 a.m. Again, comments welcome, check out our DNCB Blog at: www.dncb.wordpress.com for earlier reports and photos, and let me know if you want off this List.